Three key things jump out at you from Marc Forster’s living dead action movie ‘World War Z’ (based on the global zombie infestation bestseller from Max Brooks): a zombie headshot that traduces the screen like a cheap youtube joke, the state-racialisation of the zombie mythos and the negation of the Romero zombie. Ignoring the dumb jump shot, third things first: in the movies of George Romero we have a personal connection to the dead - from Barbara's brother's return in the first through the living-dead mall shoppers of ‘Dawn’, Bub in ‘Day’ to Big Daddy; the zombie gets close to becoming the hero of these movies. They are us; a great mass force that kills capitalism, democracy, everything, everyone has to start again; death or utopia under the worst possible conditions. Rooted in the grim politics of the Vietnam War, Romero summons an idealist pessimism. 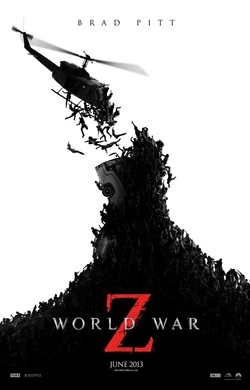 World War Z (movie) has none of that: the zombies are a virus, they have no personality, their past is irrelevant (no poignant stuff here of naked zombies or zombie Buddhists); they are uniform, hive. And they seek not to consume (which is radical! ), but simply to infect, to bite - because they are looking for healthy hosts. They ignore any non-viable organism. And here is the key: the film proposes contemporary global society as viable and recoverable; unlike the Romero tradition. The body of capital can be camouflaged as ill - it's the Society of the Spectacle folks! In order to make this portrayal, we, the dead, are not 'us' anymore; we are irrelevant to the global structure. Second thing last: in Brooks’ book South Africa and Israel are the key players. In the film it is just Israel. These nations do better than others because they are much more focussed on race, on the need for a polarised 'other', they are founded on the basis of the threat of/from the 'other', they are the ones ready to kick against globalised neo-liberalism and put up walls/exterminate and sacrifice (in South Africa recalling a racial theorist to power). Of course, in the movie, we see at the security wall in Jerusalem that some arabs, Palestinians, muslims are being allowed sanctuary and welcomed in behind the wall, like that wonderful fantasy of US refugees being welcomed into Mexico in ‘The Day After Tomorrow’ (though it is a celebration of this in ‘Wold War Z’ that brings on disaster - even minor reform is fatal to this state); but this is liberal Hollywood obfuscation; the working principle of the narrative is of the last-resort efficacy of the race-nation. This is global capital suddenly baulking at the liberality of globalised neo-liberalism; fascism as a reasonable option. As a movie ‘World War Z’ can sustain a reasonable intensity in its first two acts, but the third act in a WHO lab is as boring as hell as we get down to the tedious business of political-biology at the micro-level (like being inside the workings of a racial theorist's brain). In any decent version the last twenty minutes would have consisted of zombie-scientists slowly eating Brad Pitt down to his celebrity marrow (at least in Dead Set they had the guts to turn Davina McCall). Instead we are treated to the spectacle of a young British black woman zombified and trapped in a glass cell, depicted in a way that made many in the (all white) audience I saw it with giggle. Here was the dead and deadly heart of the movie: a horrible refixing of ‘us’ against ‘other’ that the zombie movie tradition since Romero has so often being about unfixing.